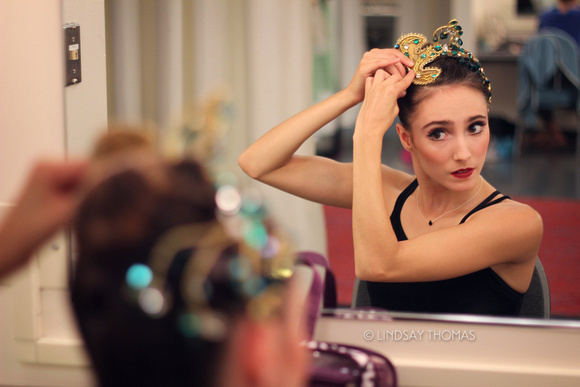 Jahna Frantziskonis, one of San Francisco Ballet’s corps members and an Audrey Hepburn look-a-like, is exploding on the dance scene with her behind the scenes access of the ballet world on Instagram. The saying goes a picture is worth a thousand words. Her photos and videos capture more than a backstage glimpse of dancers, but a gaggle of young people having fun, living their lives with friends while doing a job they love. Born in Tucson, Arizona Frantziskonis started dancing young. She began her training with Mary Beth Cabana at the Ballet Arts Tucson. She explored and developed at various summer programs including School of American Ballet, American Ballet Theatre, and the Pacific Northwest Ballet School. She danced in the corps for the Pacific Northwest Ballet (PNB) for three years before joining the San Francisco Ballet (SFB) corps in 2015. At the PNB, she was in feature roles for Justin Peck’s “Debonair” and Twyla Tharp’s “Waiting at the Stations.” Her elegant jumps, effortless looking pirouettes, and commend of the stage draws an audience view straight to the corps. Frantziskonis says, “Dance serves to connect with something bigger than ourselves. Where there is potential to create what we imagine.” As a dancer and human you can see in her photos her dreams to change the course of dance. She has a light in her that resinates through through her eyes, smile, and excitement as she rehearses and waits in the wings with her fellow dancers, choreographers, and friends. Just like Audrey Hepburn, she shines from the inside out as she is figuring her place in this crazy dance world. Check out Jahna’s Instagram here! Lauren Lovette – The Next Prima Ballerina? Even through she has the perfect body for the ballets at NYCB, she also has an effortless quality about her when she is dancing on stage. Having a dance background, the first thing I look at are a dancer’s feet. I am usually mesmerize by their feet that I never look up at their face. There are only a select few ballerinas where I am fully focused on facial expressions, leg work, and grace within their upper body, and Lovette has that power. Last year (2014) at the Vail International Dance Festival she danced excepts of ‘Giselle’ with NYCB male soloist Chase Finely. My entire attention was on Lovette, from the adagio where her arms floated like an extension of her dress as they extended with each lift and arabesque, to the ever so tilt of her head as the excerpt led into a petite allegro with quick changements, passés, and littles jumps that glided across stage like a gazelle. She has this power that brings you into the dance and makes the audience members live with her in that moment including every feeling – love, anger, hurt, adoration, happiness, and sadness. In my opinion, being a ballerina is one of the most difficult professions. There has to be not only a love of dance, but a full dedication and willingness to sacrifice. By sacrifice I mean giving up your adolescent social life to spend time in the studio practicing and rehearsing, to being dedicated as an adult by being willing to live from contract to contract, as well as working multiple jobs till you get your big break. Incompassing all of this you need to keep your body in perfect health by eating the right foods, cross training in coordination to eight hours worth of rehearsals, and getting the proper amount of rest. Lovette is one of the many ballerina that NYCB has helped to develop, but when she is on stage she has light that makes her standout. Now that she has concurred Juliet this year (February 2015), I hope to see her dance Odiet in the near future as her light continues to rise at NYCB.